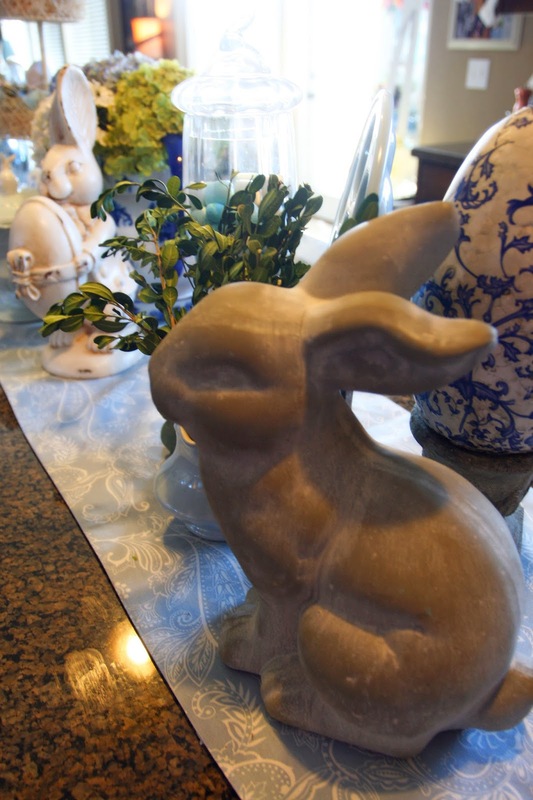 I have an Easter Decoration confession. I have A LOT of bunnies. A lot. I realized today as I was going through my "Bunnies" Bin that I seem to have collected quite a few of them. I tried to see if there were any I could bear to part with. I decided on one. ONE! The rest are just too special to send packing. Besides, they all fit in the bin, so it's not like they're taking up too much room! In case you're wondering, no, I can't add them to the "Eggs" Bin. There's no room in there. It's full too. Clearly I have a problem with eggs as well. haha. Something else that I have a lot of:Blue & White China. My Easter Island this year combines both of these collections. I'm quite in love with all of it! Let's take a tour! This little sweetie is a new purchase for me...and here's a surprise....he didn't come from a thrift store! I found him at Home Goods. I had a gift card for my birthday from my mother in law, and this is part of what I got with it. The color is perfection and I love the shape. 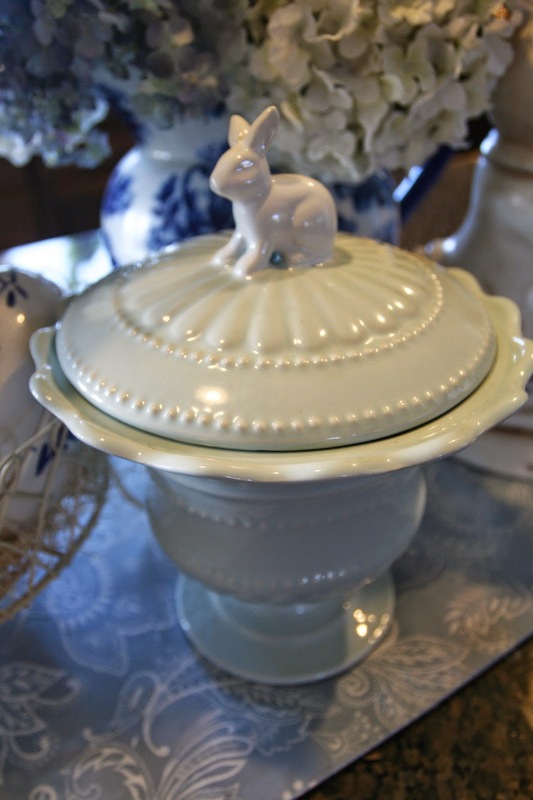 The blue egg holder plate is almost the same color as my new bunny jar...but this one I did find thrifting. 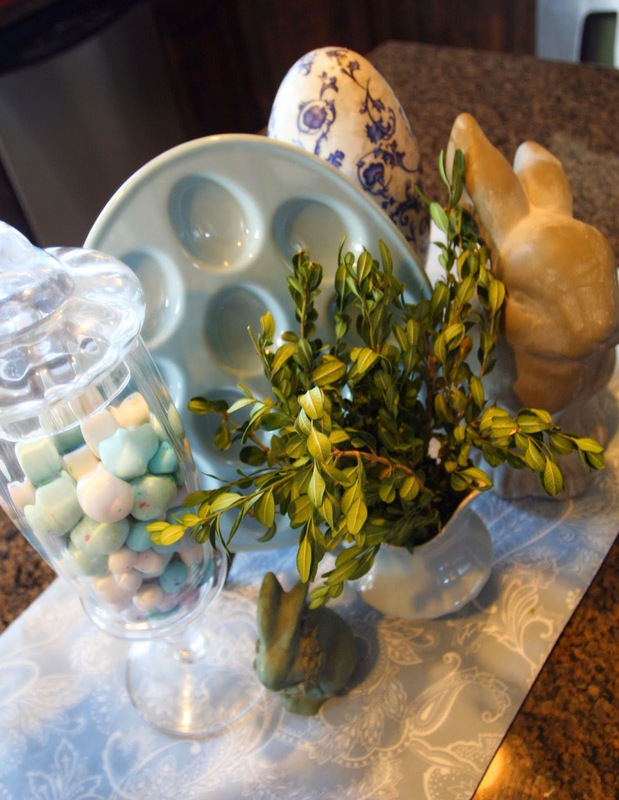 Along with the creamer, the stone bunny and the little tiny bunny! I did buy the B&W egg years ago at Taipan. 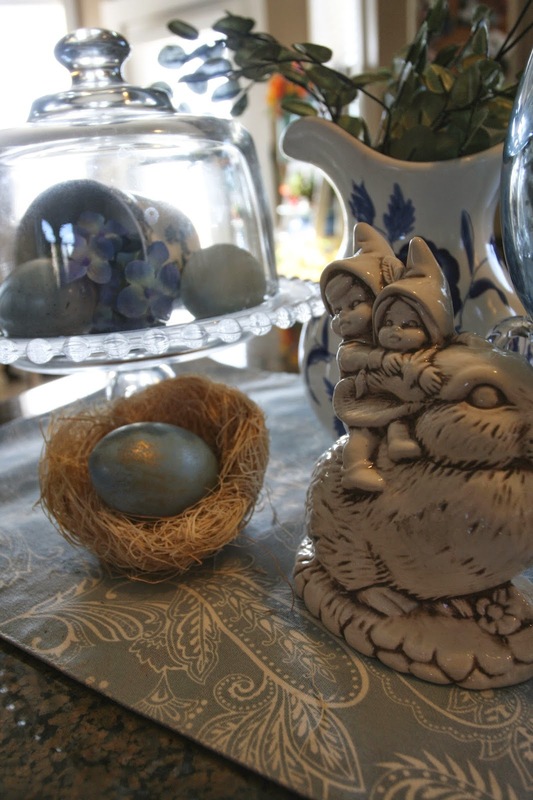 And the glass jar with the 2 sizes of speckled candy eggs in it came from Home Goods 2 years ago. Here's a tip: Don't eat the candy eggs. They're also from 2 years ago! teehee. Does anyone else keep decorative candy from year to year?? 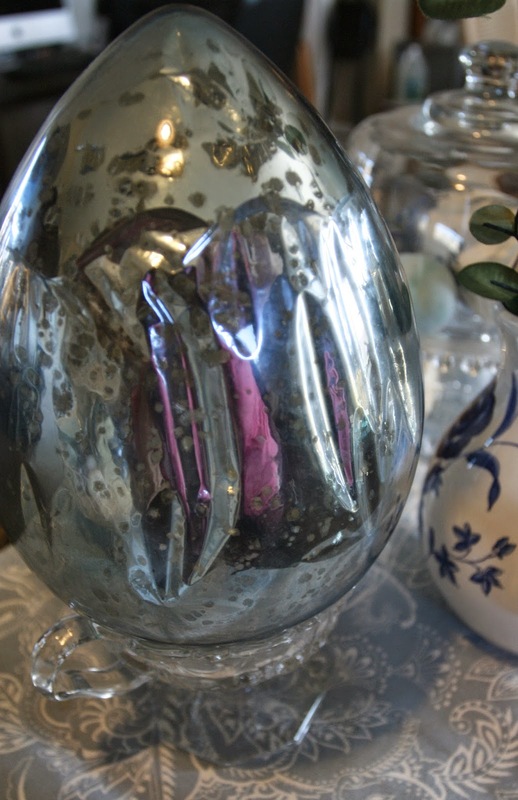 The only other new purchase for me this year....a beautiful Mercury Glass Aqua egg. I found it at one of my favorite little shops called Madeleine L'amour. It's owned by the most darling mother and daughter, and I love to call Jeni and her mom Elle my friends. They have an adorable French storefront on Historic Main Street in Bountiful, UT. If you're ever in the area, you must check them out. French, Pink and Girly just totally describes their shop! I do not know what the value of this little bunny with children riding on it's back is, but I found it thrifting for .75!! Stop it, I know!! Isn't it darling? It reminds me of a Hummel, but that's not the marking on the bottom. To me, it's priceless. This is definitely not the one bunny I've decided I can part with. The egg in a straw nest is one I made last year and gilded it. This is a former cheese board cover! I have 3 of them. All from thrift stores. 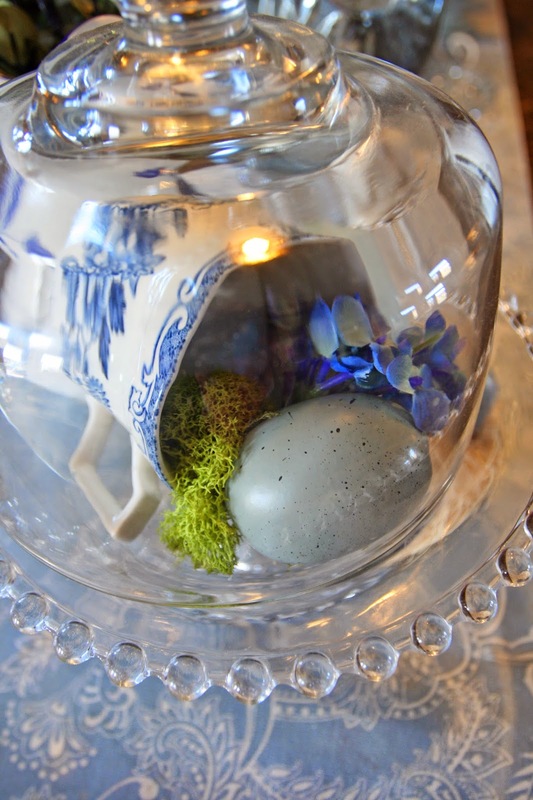 They don't hold a lot of things underneath, but it's a perfect space for a teacup turned on it's side with eggs, moss and flowers spilling out. The top layer of my wire basket is one of 2 bunnies that I found thrifting. They both had ugly ribbon and flowers on them from the 80's. Originally I was planning to give them a little liquid silver leafing, but I just decided to leave them as is for now. 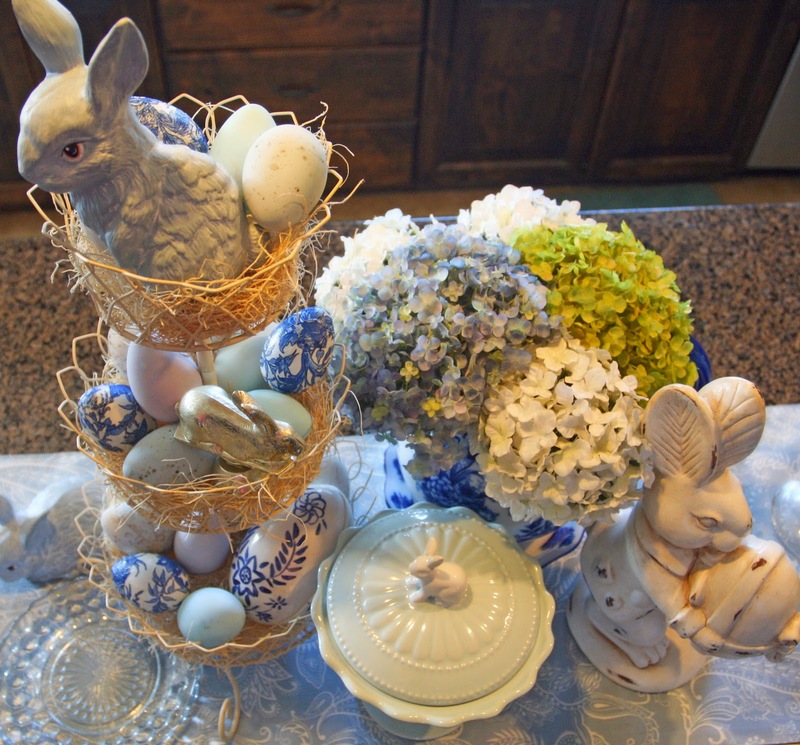 They've taken on more of a grayish hue next to the eggs I've added to the display....including the decoupaged blue and white eggs that I have included instructions for in THIS post. The whole island from the end with my 3-level wire basket right in the middle. I found the big blue and white porcelain egg in this level at....you guessed...a thrift store! It opens up and it's quite large. I love it. I have had that little baby bunny for so many years I do not even remember when or where I got it...and that's saying something! I normally can tell you where I found most things. 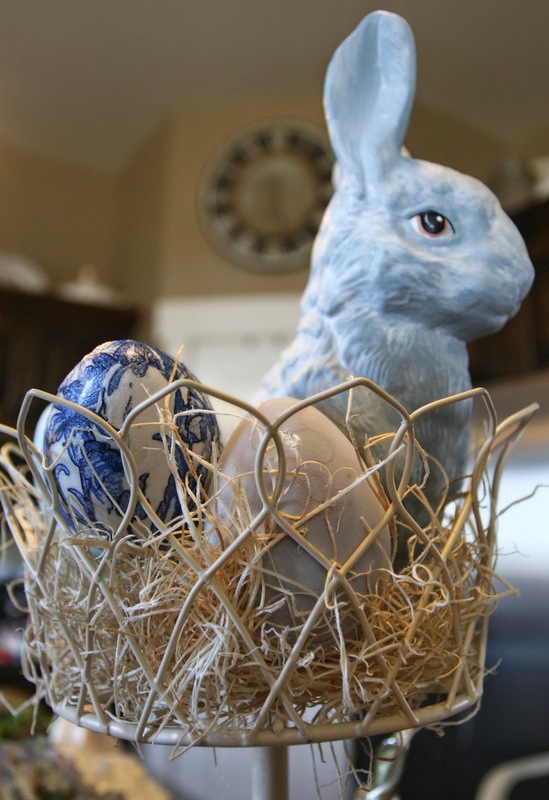 If you want to learn how I made the speckled and dyed eggs, please visit THIS post! 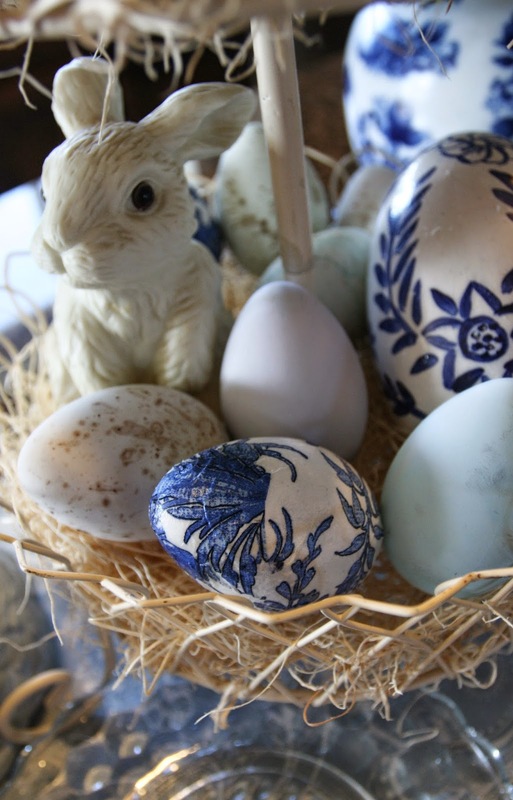 To learn how I made the smaller blue and white decorated eggs, you can find the instructions in this post. 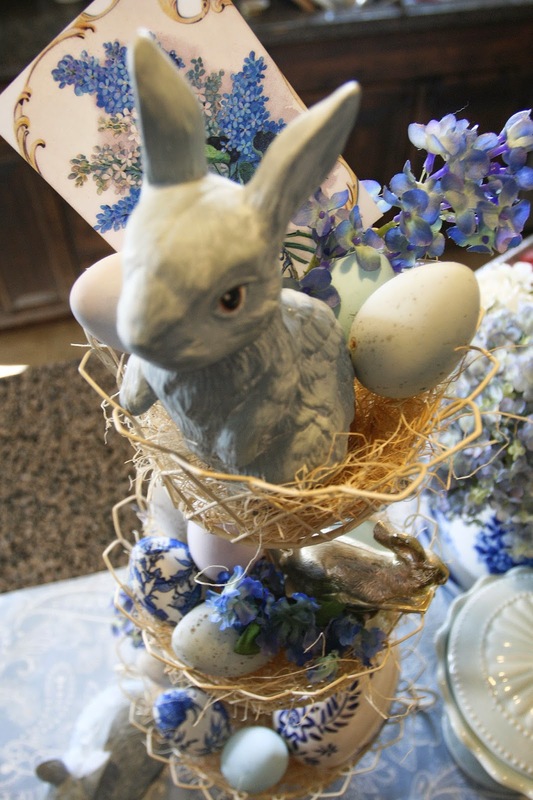 I hope you enjoyed the tour of this year's Easter Kitchen Island! 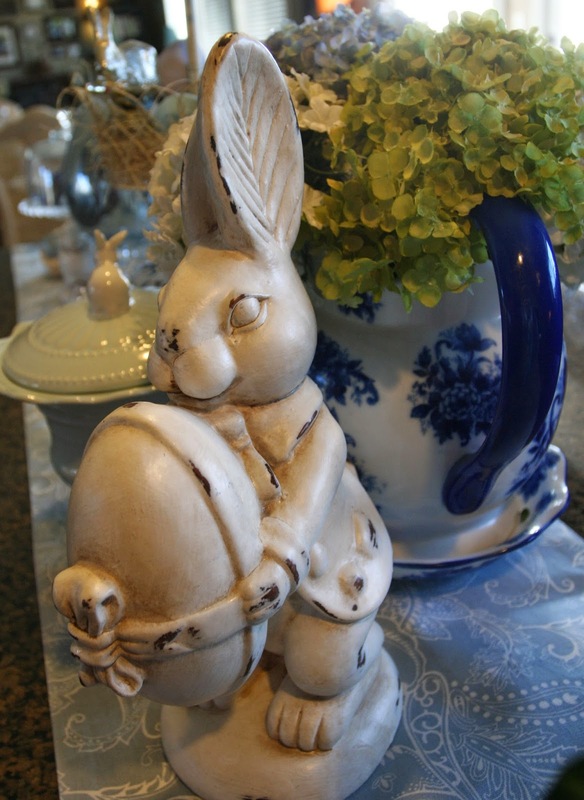 If you'd like to see another way I've used Blue and White China in my Seasonal decor, please visit THIS post from October. Emily, it is all just absolutely darling! 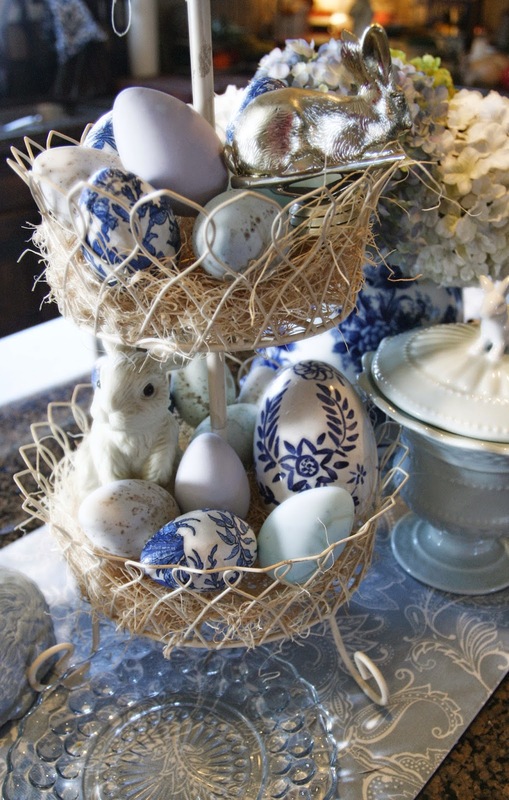 Love the idea of blue and white, not something I would think of for Easter. It's fresh and so pretty! Yup, I packed up all of my old candy (at least 3 years old) and put down on the food storage for next year. Hey, it works! Keeps us from eating it. he-he! I have three containers of Easter. I always pack my favorite things first. Then if they are full what I have left I give away. Usually to one of my daughters. I had picked up a few new Easter things at thrifts this year so one bunny couple will be gifted. Thanks for sharing your gorgeous island with SYC. Thanks Jann! Yep, I'm at 3 bins too! One for Eggs, one for bunnies and one for misc. But I had to make a new one this year since I'm moving my Peter Rabbit things to a bin with my cabbage dishes which have previously been in a box. And you're right...having them be stale keeps me from being tempted to eat them! I had to buy another package of big eggs, and some of them are in a bowl in my living room and I ate TWO of them today! Baaaaad! They are now going in a ziploc and going bye-bye!